Friday we stayed in Copper Center, at the Copper River Princess Lodge. We chose to split up in the morning. The Engineer and I caught the dog sled demonstration where a local who raises sled dogs brought 4 of his 16 dogs and hitched them to a cart with wheels and took us for a ride around the property as we learned about the care and method of training the dogs. He is definitely a strange ranger, but one comes to expect that from someone who lives by himself in backwoods Alaska with 16 dogs. And he clearly cares so much for his animals and communicates well with them. The dogs are a mix of husky and short hair, so they are small and lean and he puts sweaters on them in the winter. The others had done the dog sled demo the night before and had the same assessment. After the dogs, we met up with the Accountant and the Hipster and caught the free shuttle to the nearby National Park visitor center. Wrangell - St. Elias Park is the biggest National Park in the US. It has over 100 glaciers, and 3 of the top 10 tallest mountains in the entire country. Mt. Wrangell is an active volcano. The hikes from the visitor center were slightly disappointing in how short they were, but the views of the river and mountains were nice. We hiked all of the trails they had in under an hour and got back on the shuttle. The in-laws did laundry in the AM and then watched a moving picture, narrated show about the Aurora - review from them was that it was less than impressive. We all met for lunch at the pub at the lodge. In the afternoon, the Accountant took a jetboat tour and went salmon fishing in the Klutina River. The rest of us went on the "wild and scenic back country rafting" trip. This time, we did not have the option to paddle, but instead were ferried down the river. Our guides explained that it's safer to do it this way because when you paddle you are not looking at what is coming at you and you are not holding onto anything, therefore more likely to get tossed out of the raft. Although I liked the excitement of paddle rafting better, this option was nice in that we got to look at the surroundings much more and could take pictures. I got a short video of us going into a big rapid and will share a link when I can. The in-laws model the utilitarian, yet quite garish water gear provided for the rafting. Unlike the first rafting adventure, these were not dry suits, although if you buttoned up the collar you stayed fairly dry. We saw baby eagles and other birds, and even passed the Accountant with his fishing group along the way. He was so focused on untangling his line, he didn't even see us when we rafted by his jet boat! 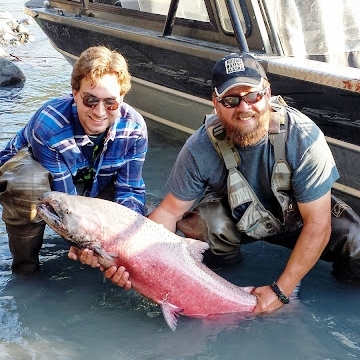 He caught a 45 lb salmon, but opted to release it because the guide explained that looking at the color it was older and the muscles were deteriorating due to the migration strain and would not have tasted great. They give you the option to ship back home whatever you catch, but this particular fish would not have been worth the shipping cost compared to buying fresh salmon from the market back home. After excursions, we got cleaned up, packed, and I did some laundry before dinner. We enjoyed dinner while watching the sunset behind Mt. 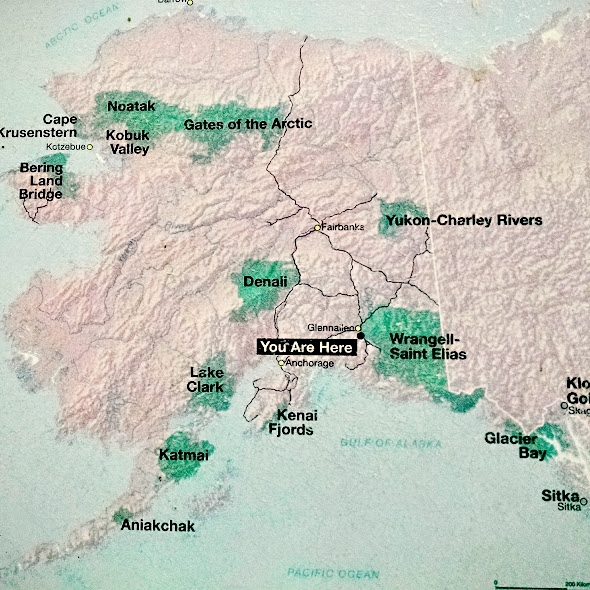 Wrangell. This was our last night as a group since the Hipster has to return to Georgia Tech and will not be joining us on the cruise. We had asked to get a wake up call if the Aurora showed either night we were there. We checked the Aurora forecast and consulted my dad (amateur weather enthusiast) via phone for the expert weather forecast and decided the conditions looked promising on Friday night, as log as there was not too much smoke from forest fires. Around 1:30 am we got a call that it was showing. We bundled up and stood outside for about 15 minutes and then it started to appear. It goes in bursts and although we didn't see colors, it looked like milky whites waves across the night sky. We watched the entire burst for about 5 min. and when it ended decided we had seen enough and went back to sleep. Overall it was disappointing, but clearly we were not seeing it at peak season and the fact that the sun never really sets this time of year means the ambient light was definitely interfering. Although I can technically check it off the bucket list, I think I want another shot at the Aurora Borealis. Saturday morning, we left at 8 am by bus destined for Valdez and are driving a very scenic route through the mountains. We stopped at Worthington Glacier for a quick bathroom break and photo op and the kids hustled up to the leading edge to see the ice cavern and get some pictures. We raced back down the glacier to make it to the bus. The bus also stopped at a nearby waterfall and we took some more family photos before we prepare to part ways this evening. We are now pulling into Valdez for lunch and I am going to try to find WiFi and post this, so you will have to hear the rest of the details about the cruise across Prince William Sound and getting to the cruise ship in the next bulletin.